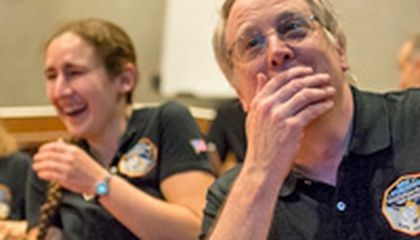 Fists hit the air and tiny American flags fluttered overhead July 14 as a huge crowd in a Laurel, Md., conference room cheered for the New Horizons spacecraft's closest approach to Pluto. At 7:50 a.m. 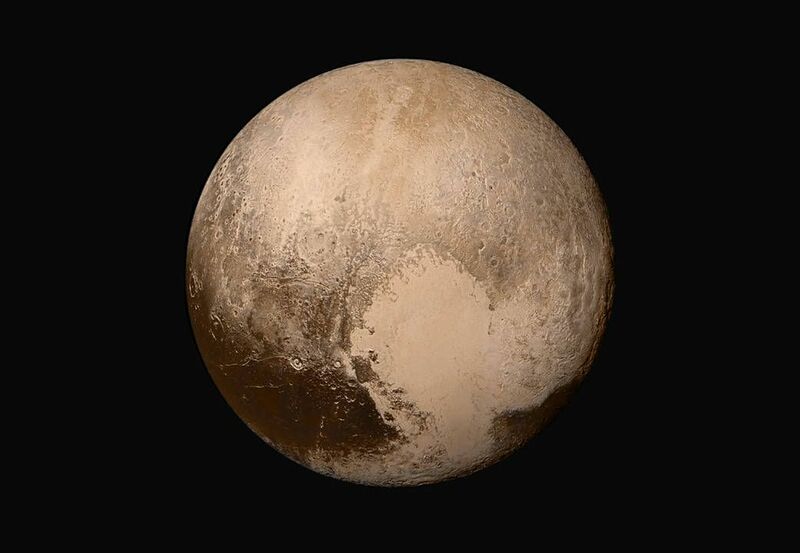 ET, the spacecraft swept past Pluto's surface at a distance of about 7,706 miles. That was closer to the tiny world than most GPS satellites get to Earth. After an afternoon of nervous anticipation, the jubilation hit a crescendo at 8:52 p.m. ET. Then Alice Bowman, the mission operations manager at the Johns Hopkins University Applied Physics Laboratory, announced to the world that the spacecraft had made its anticipated "phone home" signal. It was confirmation that the flyby was successful and that the spacecraft was healthy and ready to transmit some of its first data from the encounter. "There's a little bit of drama, because this is true exploration. New Horizons is flying into the unknown," mission manager Alan Stern of the Southwest Research Institute said during a briefing just after the flyby. "This is just the beginning," NASA's associate administrator for science missions, John Grunsfeld, later told the crowd during a postsignal briefing. "As a team, we all have made history. This can never be repeated. This is in the history books." As part of its last safety check before the flyby, New Horizons beamed back one high-resolution color picture of Pluto. It showed the surprisingly varied terrain on this alien world. With a resolution of about 2.5 miles per pixel, the stunning image hinted at a dynamic planet. It has possible tectonic activity and strong atmospheric cycles, Stern said. "This image is oriented with north at the top. The dark regions are near Pluto's equator," he said. "We can see a history of impacts, a history of surface activity. But by tomorrow we will show you images with 10 times this resolution. Pluto has a lot more to teach us with the data coming down." The reason for the long delay between the flyby and the signal home was tied to the journey New Horizons was designed to endure, says Bowman. To ensure its health during the voyage, the team wanted the spacecraft to have as few moving parts as possible. So the antenna that transmitted data was a fixed instrument. The spacecraft must take aim to Earth whenever it wants to communicate. It's not always the best position for collected data. "This is the closest approach, and this is when it gets the best science," Bowman told reporters during the pre-encounter briefing. "We don't want it to turn to Earth and talk to us we want it to do science." Even though the spacecraft was out of touch during this scientifically critical time, the mission team remained confident that everything in its choreographed dance was happening as planned. "We always talk about the spacecraft being like a child, like a teenager," Bowman said at the time. "Right now there's nothing the operations team can do. We just have to trust that we have prepared it well and send it off on its journey." Stern noted that the team had done hours of modeling and had collected reams of data on any safety hazards, like debris around Pluto that could damage the fastmoving spacecraft. The odds of something going wrong, he said, were extremely low. "The probability of loss has an upper limit at around 2 parts in 10,000. You could fly hundreds of New Horizons through the Pluto system and expect them to survive," he said. On the chance that something did break, New Horizons had been taking fail-safe data, collecting and transmitting key snippets for the main mission objectives each time it sent back a health status report. That included the newly arrived image, as well as shots of the large moon Charon. The data included mapping, spectroscopy, thermal data and information about the dust and plasma environments around Pluto and its moons. The July 14 signal, while a sign of success, did not include any additional teasers. "The signal we got tonight was entirely engineering data no science data came home tonight," Stern said during the evening briefing. "We wanted that report to be as brief as possible because as soon as it was over, New Horizons went back to work to collect that data." Once mission managers knew the craft was safe and loaded with data, the team eagerly awaited a fresh round of scientific wonders. "It is truly amazing ... the recovery was flawless. We were up to the challenge. We met it," Bowman added. "And on a personal note, I can't express how I'm feeling to have achieved a childhood dream of space exploration. I'm pretty overwhelmed at this moment. "Please tell your children and anybody out there: Do what you're passionate about. Give yourself that challenge and you will not be sorry for it." Why were tiny American flags raised? What is American about Pluto?